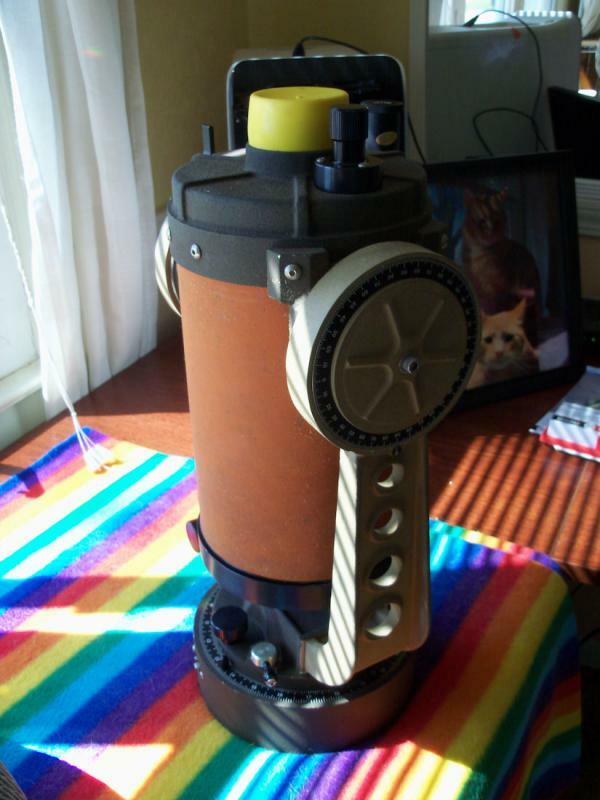 Hi, just ran across this revived thread and am posting the info for my 'little pumpkin' C-5. Its Serial No. is 3307 2 or 3rd Qtr. of 1972 as i read your guide. 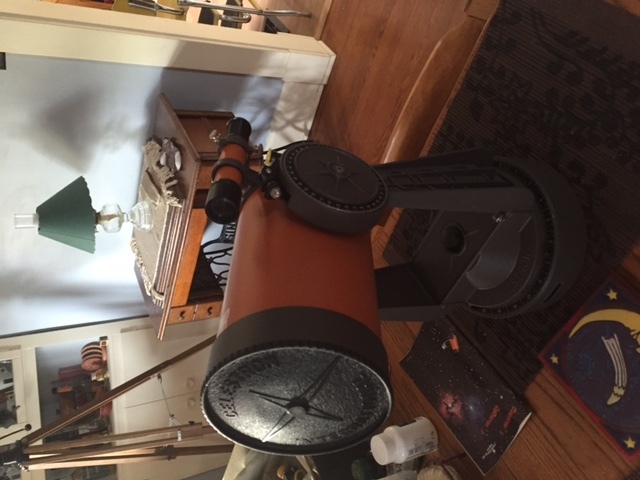 I acquired it from friends a year or more ago and had it cleaned by Cathi Havens at S&S Optika here in Denver, CO. 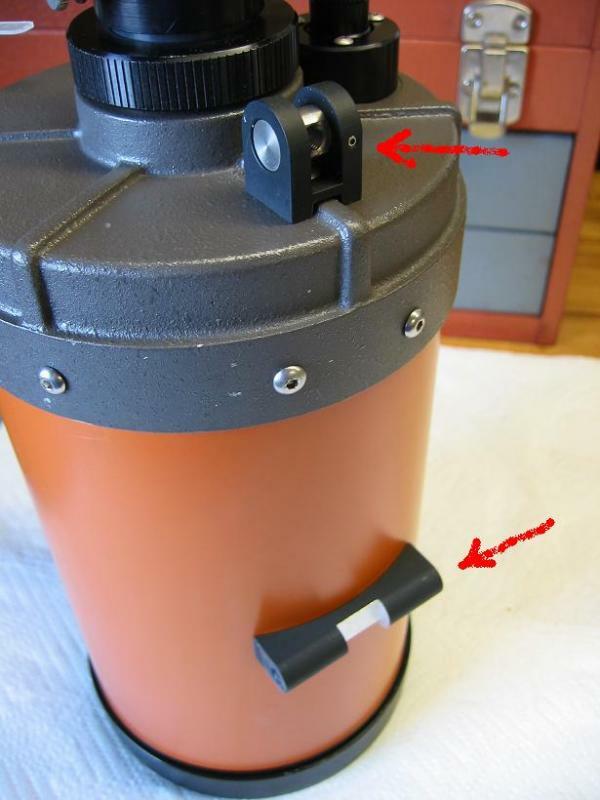 The corrector had a thick 'fog' on it, probably from the original foam that deteriorated in the case it was stored in. Other than that its in good shape and the paint still has a 'sticky feel' to it, peculiar tot he paint used on early models. Cathi told me she thought it was a very early model from the serial no. and was probably sold by them originally, although there is no original owner info. It has all the accessories + wedge, but no tripod. My friends bought it used from S&S over 10 years ago. 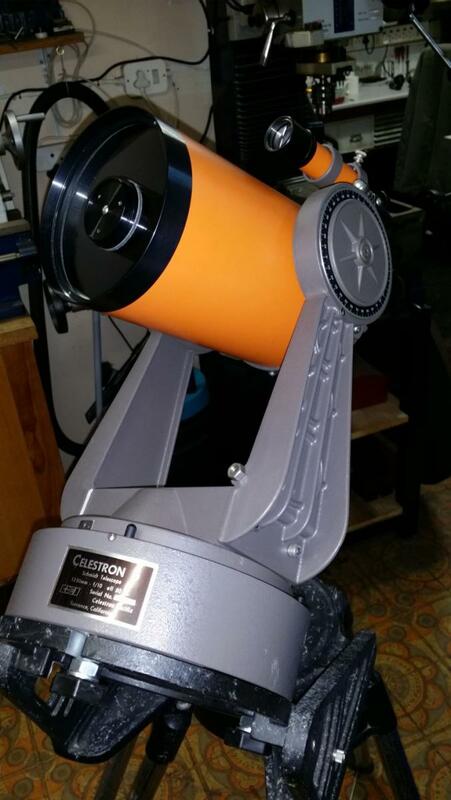 S&S is the 2nd oldest Celestron dealer and will be closing their doors and retiring after 43 years this Sat. Oct. 31. 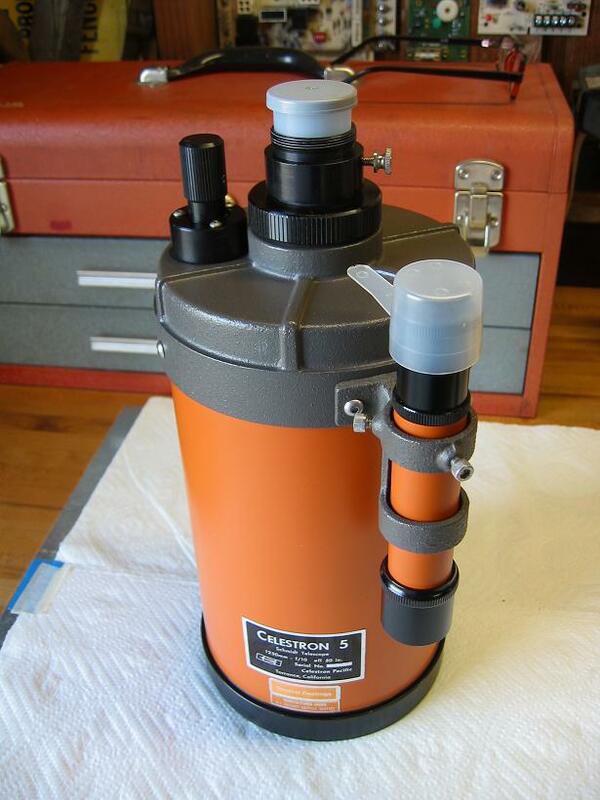 We are losing a major resource for these classic scopes. It was late and I was in pain. Not the best conditions to re-dismantled an OTA. I decided to give it just a blind try: unscrewed the corrector retaining ring and turn the corrector 90 degrees and check again. From 3 o'clock, where do I go? 12 o'clock? 6 o'clock? Oh, well, in the end it is just a matter of 6 screws. If I'm wrong I'll do it again. So, first try: 12 o'clock. Six screws in and (limping) back to my table. Polaris... oh wow! Wow! Wait a sec. Let's play it seriously. Up to Vega. Ohhh, WOOOW! Ok, now THIS is a star test. Zero astigmatism and spherical, not excellent, just perfect. 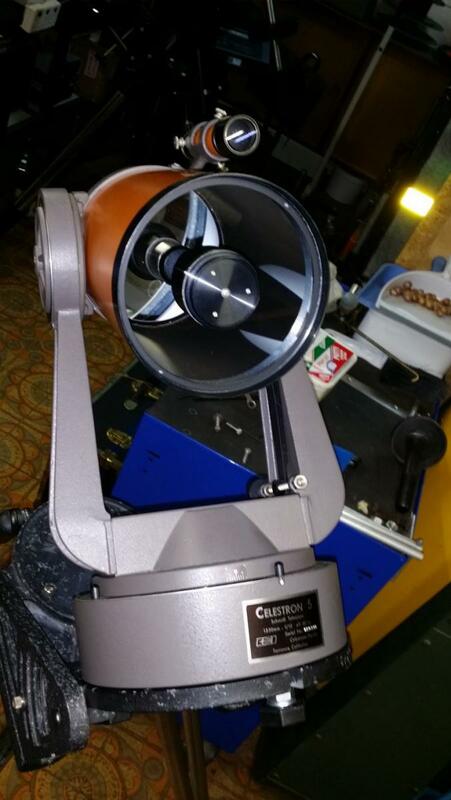 I mean, if I had a Celestron optical engineer here around for a touch-up, I'd tell him to go away and leave the OTA alone. I don't know what it would happen with the plate turned at 6 o'clock, but at 12 is just... a fingertips loud kiss! Will this be confirmed by the back of the mirror? The day I'll decide I've nothing better to do, I'll check. Don't hold your breath though. This telescope is as good as one could possibly ask for. 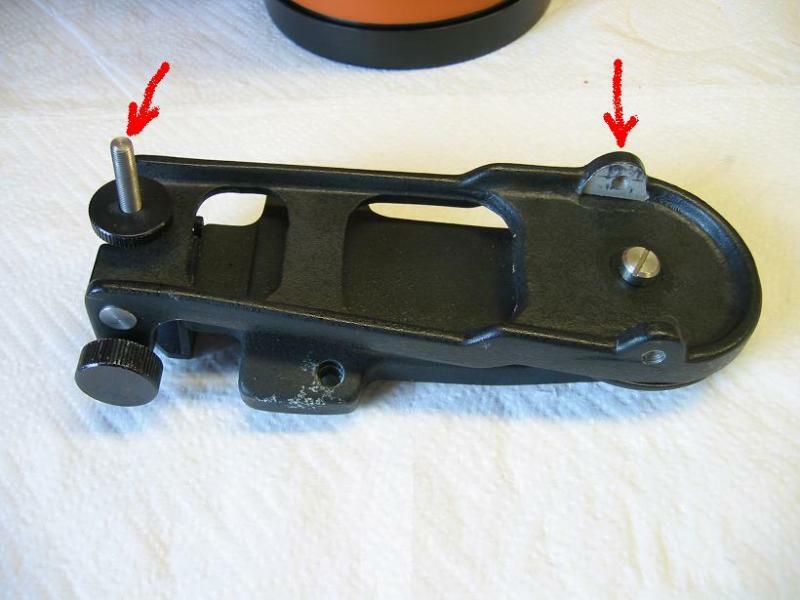 Till it performs like this, I won't mess with a total dismantling of the focusing mechanism. In the meantime, here is the reverse side of this fork-mounted OTA. Really neat. 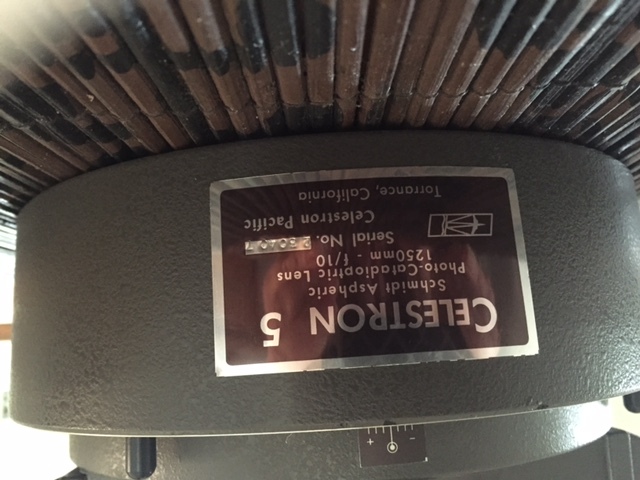 Can you describe the test procedure you used to check for spherical aberration and what eyepiece did you use ? 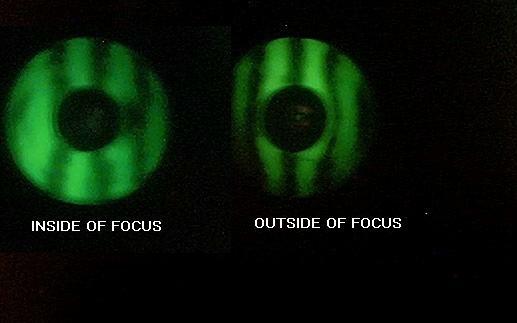 Regular diffraction image in/out defocusing, 3 to 5 waves. Nothing more and nothing less. Zeiss Abbe 6 and 4 mm. Here is another one for the list. It is serial number 44 and I picked it up off of Ebay a few weeks ago. 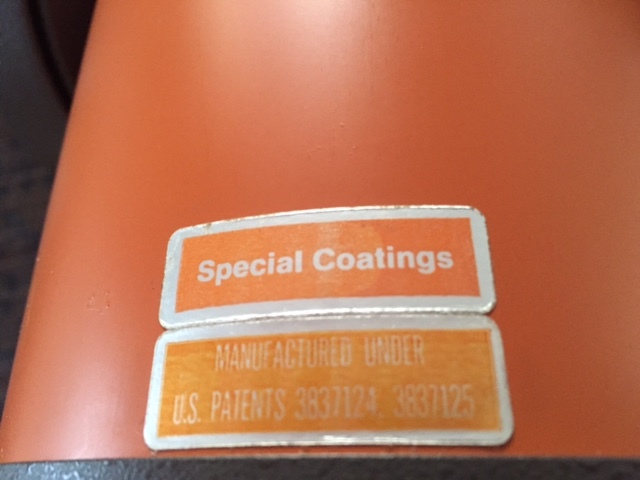 Mechanically it is very good but as usual the tri-color paint has gone bad and will need to be redone. Optically I bet most would say it is good but the test stand show differently and the results are typical of the many many SCT I have tested over the years and also of the ones I have refigured. The optics are rough and undercorrected. They will show you craters on the Moon, bands on Jupiter and the rings around Saturn but they will never give you that spacecraft fly by image that true 1/8 wave optics will show. 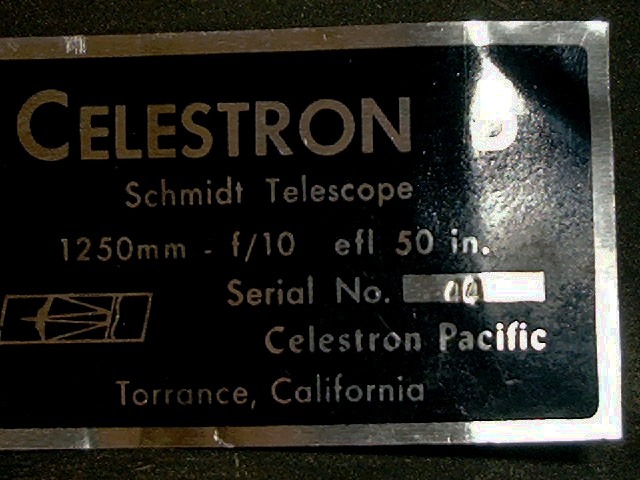 It is unfortunate that the original owner used this scope most of his life and never got to see a truly good image if this was the only scope he used. 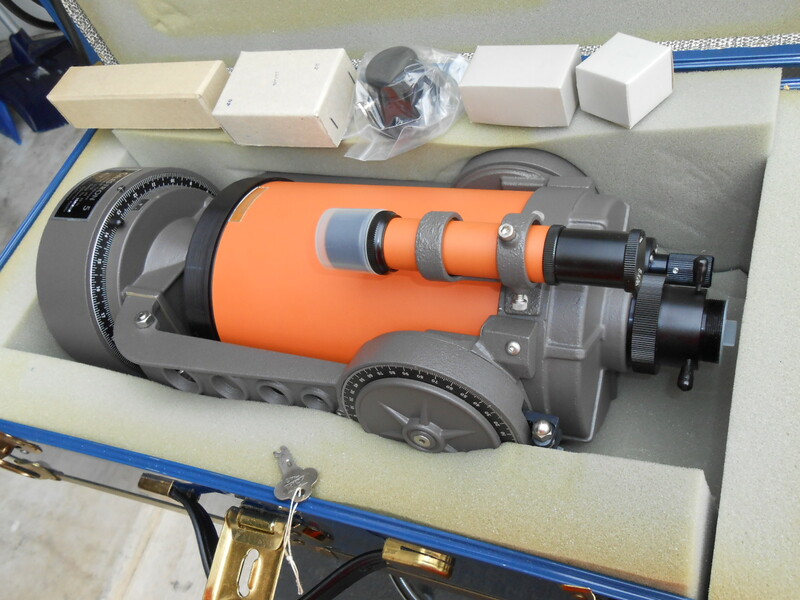 Here are some pictures of the scope and the optics being tested via double pass autocollimation. The Ronchi bands bow inward on the inside of focus and outward on the outside of focus. That indicated under corrected spherical aberration. Also note the bands are not smoothly bending and are not symmetrical right to left. This indicates zones and rough optics. You can spin that corrector until the cows come home and it's not going to help the image no matter what the guys in the CAT/Cass forum say. The last image is one of a very good 80mm objective to show how good optics should test. Another project to add to the list to make this little guy right. Sorry to hear about your accident, hope you are well mended soon. 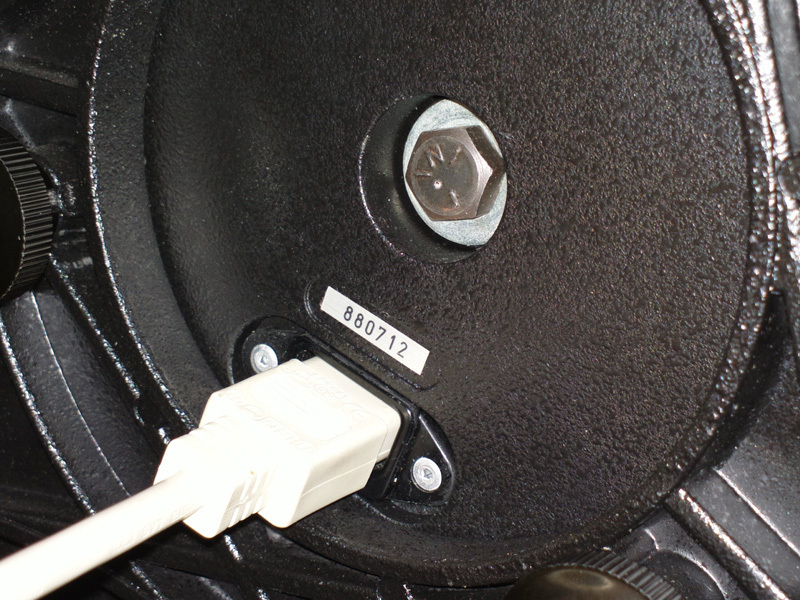 OK, here's the serial number on the back of the secondary of my silver-gray tube C5: 69612. What do these lucky numbers tell me? Edited by Sarkikos, 31 October 2015 - 08:46 PM. My addition to the herd....found this orphan a few days ago. 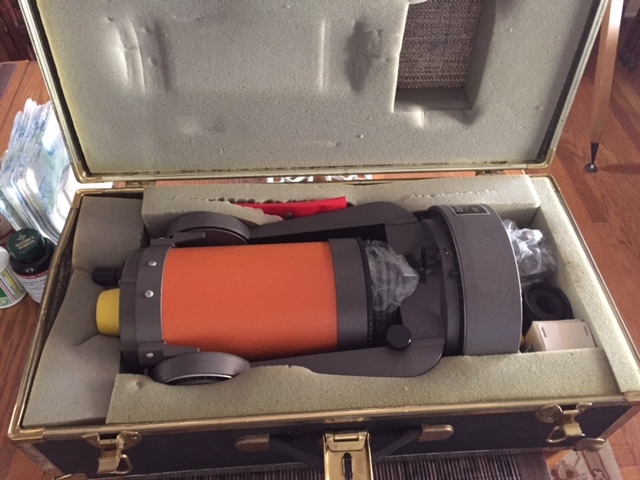 Complete with case, tripod, wedge, finder, various .965"eyepieces, visual back, diagonals, porro prism, T thread adaptors....the whole shebang! She cleaned up pretty well too. She's generally in pristine condition. Edited by Martin Lyons, 02 November 2015 - 01:07 PM. Best darn C5 I've ever seen. 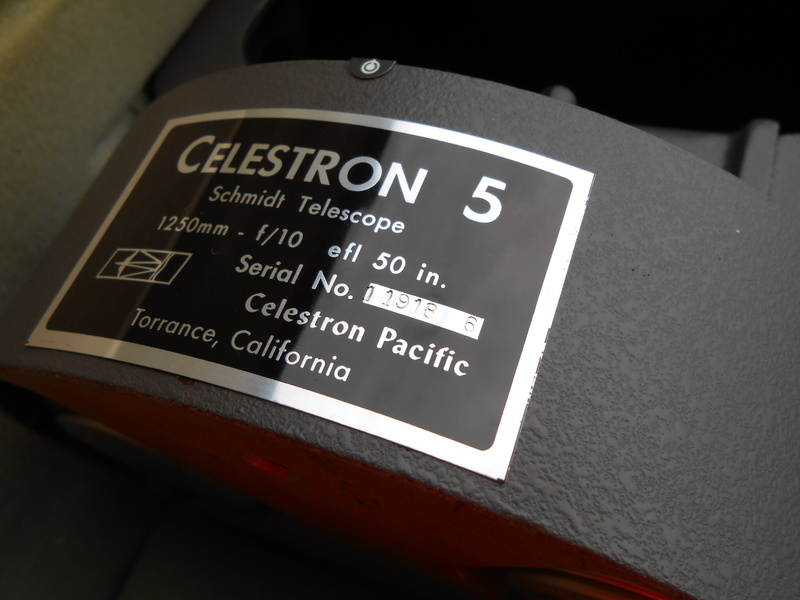 Complete as shipped from Celestron includes original shipping box. Ronchi lines like jail cell bars - amazing! High contrast razor sharp images. Time capsule brand new condition. How come so many digits as my white OTA is 53329, no drive? Wow Albert! Amazing! Looks like you found a 'wayback machine' and hopped in it to bring that one back to the now! There's an interesting story behind this C5. 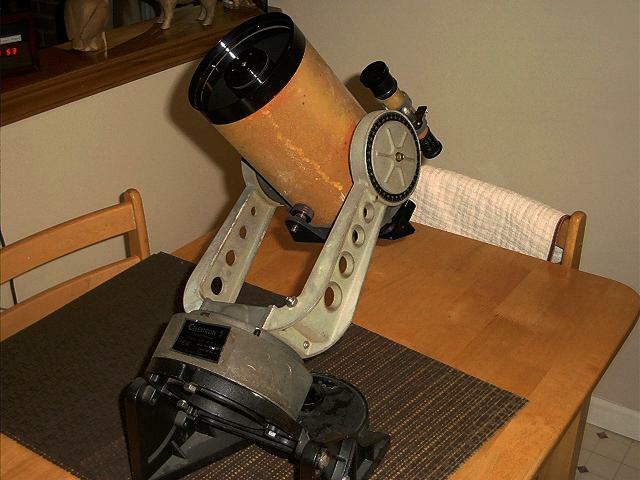 This Celestron was purchased by one of Americas highest ranking "Darby's Rangers". 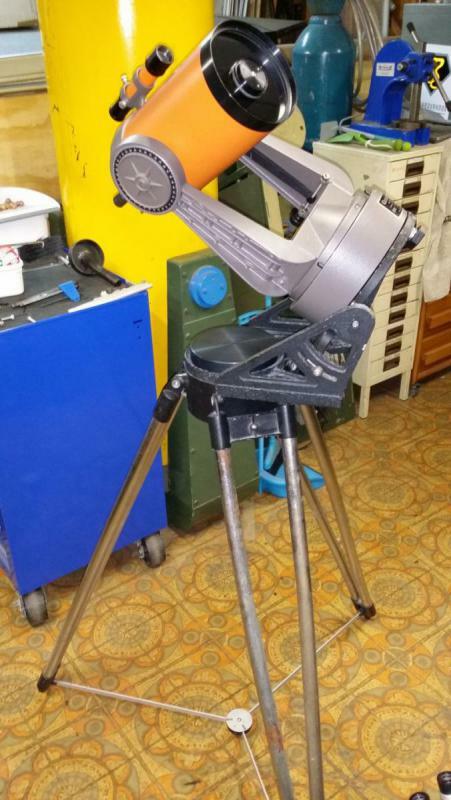 This elite World War II soldier enjoyed birding with his little C5 for the first few years he'd owned it but unfortunately, became ill soon after and the scope sat boxed and unused for many years. This fellow was the elite of the elite in World War II, sent on extreme missions and fought in intense battles from North Africa to Italy. From what I understand he was a real hero. He was enlisted as one of the consultants for the movie "Darby's Rangers" starring James Garner among others. With this little telescope he was quite content enjoying the beautiful nature his large property had to offer. According to his son, now 67, he'd spend countless hours looking through it with which he'd identified more than 70 birds in that yard. He passed on in 1990. One of Americas greatest. 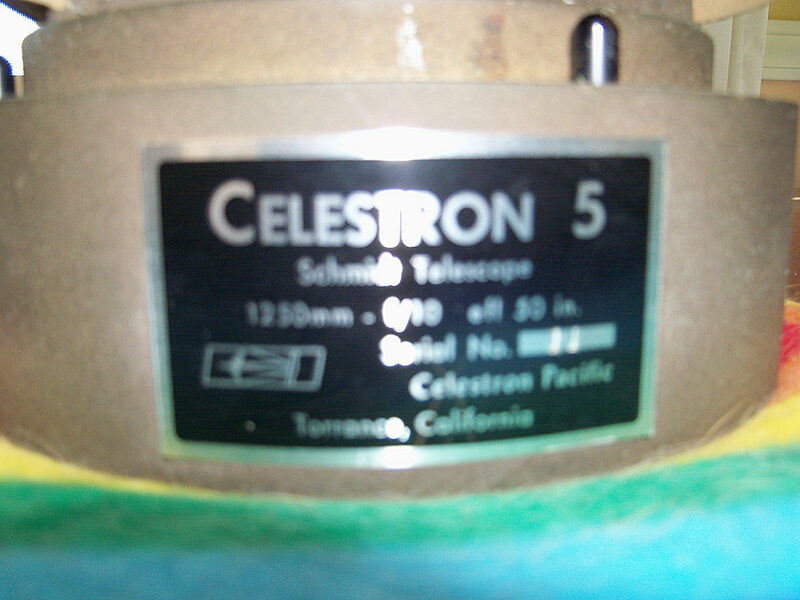 I am proud to have his telescope. Edited by albert1, 23 February 2016 - 12:55 AM. I will be adding one to the list in about a week! I always wanted one of these. When they came out, there was no way I could afford one. First with finishing grad school and then with two babies. Well I finally found one that I think will be very nice. Good for you, Terra. Can't wait for the photos. I am pretty excited Albert. Like yours, it looks practically brand new! I have wanted one for years. Finally getting it! 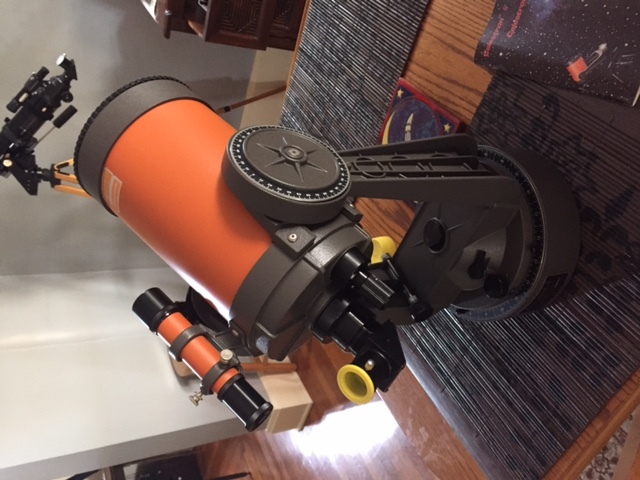 It really is a wonderfully crafted little telescope. Such a compact bundle of joy. I know you'll feel the same. Will be keeping an eye out for your photos. Good luck, Terra. 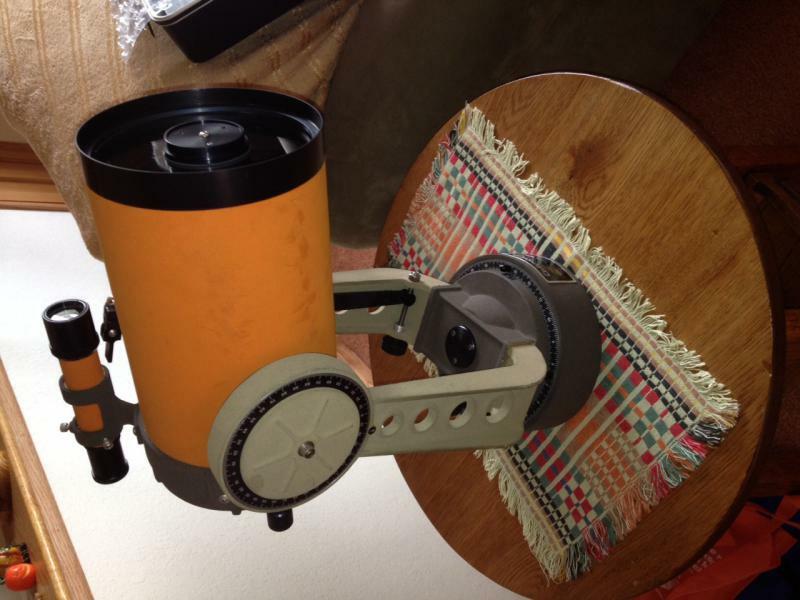 This is my Celestron 5 which I bought from someone in 1974. It is serial number 11 so I suspect It was built in 1971. Still have the wedge and tripod but I bought those in 1975 I believe. It is in fair shape though there is some grime on the tube which I can't figure how to get rid of. The fork nount had so corresion too. 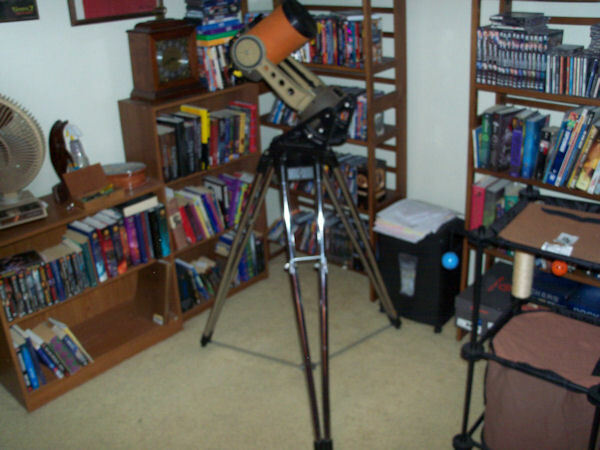 The telescope is still functional though. Edited by wrpspeed16, 08 April 2016 - 07:15 AM. 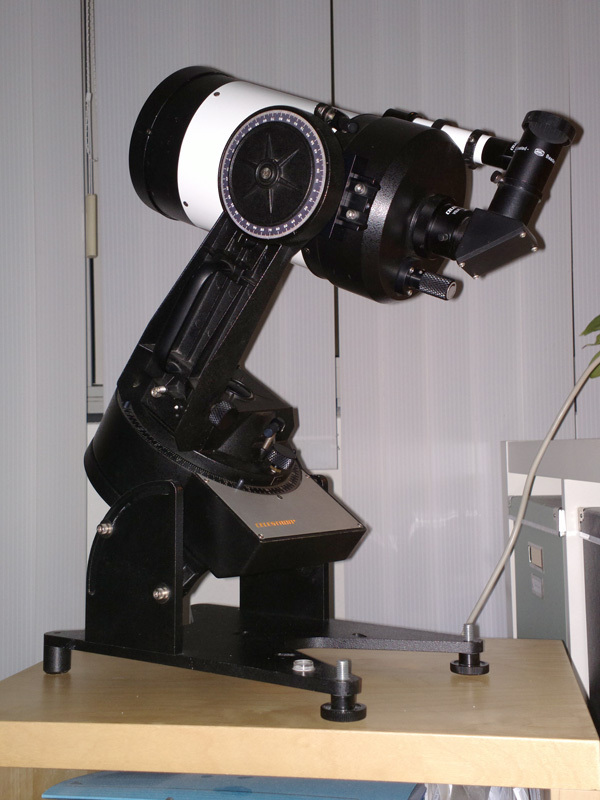 I recently purchased a C5 guidescope. Front cell is machined and anodized with screw in retainer. Edited by actionhac, 08 April 2016 - 10:13 AM. The mounting points for the tangent coupler. Edited by actionhac, 08 April 2016 - 10:17 AM. My new old C5 arrived today! Totally complete and very minty! I have my little grandson for Spring Break. He helped me open the package, nicely double-boxed. He said "Grammaw, what's in that treasure chest? 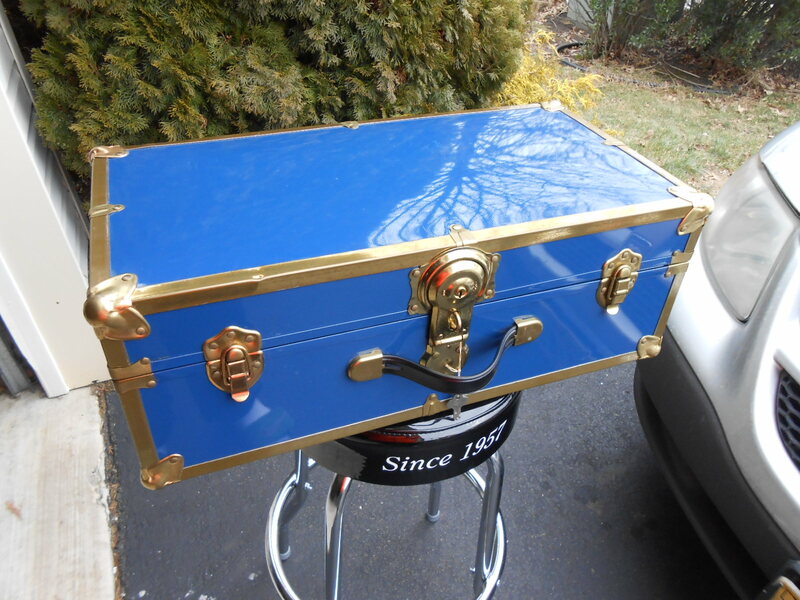 Somebody sent you a treasure chest!" So cute! Anyway, pictures will follow in a couple of days. I kind of have my hands full right now. Well, the little man went home yesterday and so I finally had a chance to give the C5 the time it deserves- indoors anyway. It is still cloudy and raining, and the Telescope Gods being as they are, the nasty weather that set in yesterday should last about two weeks! Anyway, here are some pictures. It is very minty, and totally complete. I can already tell that I really like this little bugger! 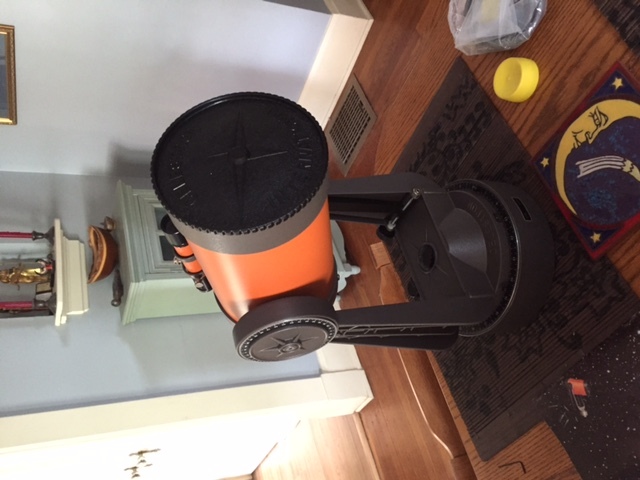 I think this is going to make a nice roadtrip telescope- maybe for next year's solar eclipse. 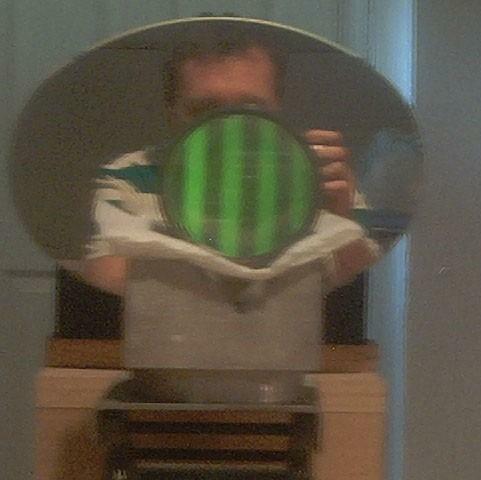 I will have to get a nice over-aperture solar filter for it, and maybe a stopped down, off-axis ERF for H-alpha.